Rev. Fr. Alexander (James) Kurien came to the United State of America after finishing 12th grade. Upon completing his Bachelor of Arts (BA) in religion and business, Master of Philosophy (M.Phil. ), and Master of Divinity (M.Div. ), he was ordained a deacon in 1983 by the late His Grace Philipose Mar Theophilos of the Mumbai Diocese and the late His Grace Dr. Thomas Mar Makarios of the American Diocese. On June 28,1987, he was ordained to the priesthood for the Kottayam Devalokam Chapel by the late His Holiness Baselius Mar Thoma Mathews II in the blessed presence of late His Holiness Baselius Mar Thoma Mathews I, late His Grace Mathews Mar Epiphanios, and the late His Grace Dr. Thomas Mar Makarios. 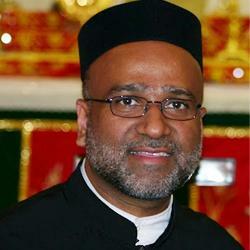 He served St. Mary’s Orthodox Church of Tampa, Florida during the first two years after his ordination. In 1989, he was appointed as the officiating priest of St. Thomas Orthodox Church 7321 Windsor Mill Road Baltimore, Maryland and St. Gregorios Orthodox Church 2337 Fairland Road Silver Spring, Maryland, and became the vicar of both in 1990. After serving 18 years, in 2007, he took a sabbatical from the vicar ship; continues to enjoy his ministry. He has also completed: Master of Business Administration (MBA) in Finance, Master of Strategic Planning (M.S. ), Chartered Financial Analyst (CFA), Fellow of Royal Institute of Chartered Surveyors (FRICS), Counselor of Real Estate Valuation, (CRV), Certified Business Valuer (CBV), and Member of the Appraisal Institute (MAI). In addition to the ministry, he is employed by the United States Government, as the Director of the Office of Strategic Planning at the United States Department of State in Washington D.C. He is married to Anna (Ajitha) of Kallelil house, Kathrikapally, and they have been blessed with three children: Alyssa, Natasha, and Elijah..